Super cute. Would love to win. Like totally target already on FB. I would love to win this so I could purchase dog food, cat food, and litter for my local shelter. An employee stole their year supply of money to feed the animals and they are running short, even collecting cans to trade in for cash for food. subscribed to email. Would love to win. I already love totally target! i could really, really use this. i am always hoping to win. 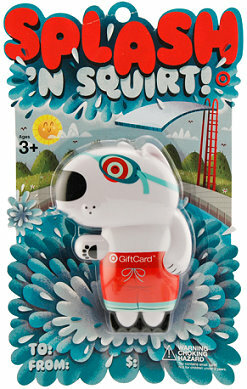 Love to splash around, thanks Totally Target! Please enter me in your giveaway, thanks! Too cute! Would love to win. I like you on facebook! Geat Blog! I signed up for your e-mails! Thanks!!!!! I would love to win. Thanks TT. cute giftcard!! i would love to win!! !